Vegas is back! MGM is winning big in U.S.
Don't go all in on Macau just yet. The Chinese gambling mecca gets all the hype these days, but it was actually fireworks in Vegas that carried MGM Resorts (MGM) to a big earnings win on Tuesday. The owner of the Bellagio and MGM Grand raked in more cash in Vegas thanks to higher occupancy rates, loftier room prices and a stronger percentage of gambling winnings. In this case, the house is clearly winning. MGM investors cheered the domestic strength, bidding the casino operator's shares as much as 2.5% higher on Tuesday morning before they faded a bit. After being dealt a bad hand last year, MGM swung to a per-share profit of 21 cents during the second quarter. That blew away expectations for a profit of just 10 cents a share. 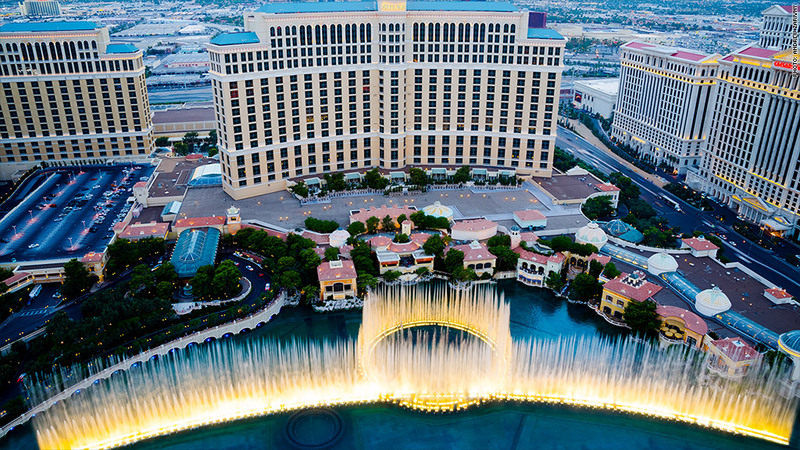 MGM, which also owns the Mirage, Luxor and Mandalay Bay, said its Vegas occupancy rates ticked up to an incredible 96% last quarter, while average room rates rose to $141 from $134. Domestic slot revenue dipped 1%, but MGM said the percentage of table games bets that it won jumped. The ability of Las Vegas ability to attract more conventions (everything from Trekkies to adult film stars) also boosted food and beverage revenue. Related: Is the Michael Kors party over? MGM's Vegas business also received a shot in the arm from CityCenter, the gargantuan complex that was nearly killed off by the financial crisis. Adjusted profits at this project soared 20% during the second quarter. MGM isn't alone in terms of good fortunes in the Sin City. Last month, rival Wynn Resorts (WYNN) revealed stronger-than-expected Vegas results. The growth in Vegas helped bankroll MGM's Macau business, which struggled due to less action from high rollers, who are known as "whales" on gambling floors. Revenue dipped 1% as higher total gaming revenue was offset by lower VIP revenue.